You are visiting the "History - Part I" page. The links with asterisks in front will return you to either the parent or "Home" pages. Click on any thumbnail size image below to enlarge it, then click on your browser's back button to return to this page. Beardie-like collies, as workers, existed on the British Isles for a very long time. How far back they can be traced is difficult to say. Like other kinds of utilitarian dogs from olden days, the Beardie-like dogs evolved due to several factors: the region where they resided; the climate; and the conditions of the terrain they traversed. The type of work performed by these Beardie-like canines also assisted in their being described and/or categorized as a "sheepdog" or a "drover's dog." Where they resided within Britain brought about various names to describe this type of dog. The names, to name a few: a Beardie or Beardy; an Old-Fashioned Collie; a Rough Coated Collie (this can be rather confusing since the modern Scottish Collie developed into two varieties, one of which is a "rough coated" type, similar to the well known "Lassie"), a Highland Collie; a "hairy-moued collie," a "stumpy," an Old Welsh Grey; a Smithfield; and a Border Collie (due to some of the dogs residing in the borderlands in an era long before the Border Collie got its breed name in the 1900s). The Beardie-like dog played into the background of the Old English Sheepdog and the Smithfield. A noted dog historian and author, Col. David Hancock, suggested caution should be used when differentiating types of dogs as "breeds." Borrowing from some of his words, "Superficial physical similarities in historic depictions are the pig-trap for every breed researcher;...." That begs the question: when does a particular dog type become known as a "breed"? One could certainly argue that once a standard has been associated with a particular type of dog, it takes on the connotation of being known as a "breed. The first known standard for the Highland, or Bearded Collie, was written in 1891 by D. J. Thomson Gray and appeared in his book Dogs of Scotland. But shepherds did not then, nor do they now, concern themselves with "standards." Many people have likely heard the phrase "form follows function." When dogs were used strictly for utilitarian purposes, form followed function. But once dog shows began, form became the function. It only stands to reason that shepherds did engage in some sort of breeding goals to produce offspring that could be used to assist them in carrying out the work that needed to be done. Certainly the working Beardie-like dog (in spite of the various regional names used to describe this worker) did exist, no matter the breed name used, prior to Gray's standard being written. Regarding the Beardie-like canine, shepherds point out two things commonly associated with this worker: (1) its style of work; and (2) the presence of a beard under its chin. Colour, length of tail, body shape, overall size, thickness of coat, etc. varied. Archaeologists have discovered remains of dogs in Britain dating back to the Old Stone Age. Such archaeological discoveries support the suggestion by many scholars in the field of archaeology that the dog was the first of all animals to be domesticated by humans. The raising of livestock in Britain traces back to the Bronze Age according to several scholarly writings. During this era (~2,000 BC), Britain's population became an agricultural civilization. Raising livestock became an important part of that agricultural environment. Would not dogs have become important to farmers needing protection for their sheep and cattle from the wolves? Perhaps this era marks the beginning of some form of selective breeding in order to enhance the guarding and working abilities of dogs. It stands to reason that farmers likely began breeding dogs for certain characteristics due to their need for livestock management. Cynologists (cynology being defined as the "study of dogs") and/or authors such as James Watson, Robert Leighton, Edward C. Ash, Clifford Hubbard and Col. David Hancock devoted many years in researching canine subject matter to formulate their historical writings throughout the 1900s until the present. Unfortunately, there were some writers that borrowed the words of some authors without doing thorough research. For that reason, caution and skepticism might be a good thing to keep in mind. The Boke of St. Albans was published in 1486. It was the first book on hunting in England. Many authorities have stated that this book was attributed to Juliana Berners, a prioress at the Sopwell Nunnery (around 1481). Ash, however, expressed doubts about Berners being the author of the writings because it was established that no such prioress resided at this Nunnery during that period of time nor was such a lady confirmed to be Lord Berners' sister. Ash stated the Boke of St. Albans was mainly copied from The Master of Game written between 1406 and 1413 by Edward, Second Duke of York. According to scholars, the Duke translated, with interpolations, Gaston de Foix's Livre de Chasse (though Ash wrote that the Duke did write five original chapters). Hubbard's view about Berners differs from Ash. In his book The Literature of British Dogs (1949), Hubbard stated his belief that the section on hunting was likely Berners' own original compilation based upon her signature at the end of the chapter. Hubbard mentioned that certain types of dogs listed in the Boke of St. Albans remain unknown; however, some were known, and of those, they were not purely native breeds. Rather they had been in the British Isles for a very long time. Hubbard paid a high compliment to Ash when he wrote "...undoubtedly the greatest work on the dog ever printed in English is Dogs: Their History and Development (1927) by Edward C. Ash." That was quite a compliment considering that "Doggy" Hubbard owned the largest private collection of dog literature (at least in Britain) prior to the time of his death. Ash's 1927 book indicated that Conrad Gesner's writings were the first serious attempt to deal with dogs. Gesner was also known as Konrad von Gesner. Dr. Gesner (1516-1565), a Swiss physician and naturalist , wrote to Dr. Johannes Caius (pronounced like "keys to a lock"), an English physician, asking for a description of British dogs. Dr. Gesner wanted to include this information in an updated version of his earlier natural history writings. Dr. Caius (1533-1603), the physician-in-chief to Queen Elizabeth I, responded to Gesner's request by writing a letter in Latin describing different types of dogs in Britain, but that letter went unpublished. Five years after Caius sent his first letter to Dr. Gesner, he sent a second letter which was more descriptive about dogs. Gesner utilized the information contained in the second letter. This second letter was also published in Britain (as a small book) with the title De Canibus Britannicis (shortened title) in 1570 (five years after Gesner's death). The book's significance was that it was the first book devoted entirely to the subject of dogs. Caius categorized the dogs; one classification was the "shepherd's dogge." Caius' writings were translated by his assistant, Abraham Fleming, to English, and that translation was published in 1576 under the name De Canibus Britannicis Of Englishe Dogges. Regarding Edward Ash's own conclusions, he wrote "It is difficult to say if the bearded collie was in the distant past indigenous to Scotland, or whether at some early age these heavily-built matted-haired dogs evolved in some northern area of Europe and spread to Scotland." The first two images below are from a portion of a page published in a book on quadrupeds by Jan Jonston (1603-1675) (also known as Joannes Jonstonus). The second image below also appeared at the end of Edward Ash's The Practical Dog Book, Page 330, with the words: "From a German Natural History of 1650." Ash did not discuss the image or Jonston in his book, and why it appeared on that page is unknown. Ash also used at least one other engraving of a dog from Jonston's illustrations within his book. Jonston was a Polish scholar and a physician who descended from Scottish nobility. Jonston had studied botany and medicine at the University of Cambridge. His work in Latin entitled Historiae Naturalis De Quadrupetibus (c. 1650) included a section entitled "De Quadrupedibus Domesticis." His work was translated into English in 1657. Sixteen drawings of canines appeared under several names starting with either "canis" or "canes." The engraving entitled "Canes" set forth several dogs. 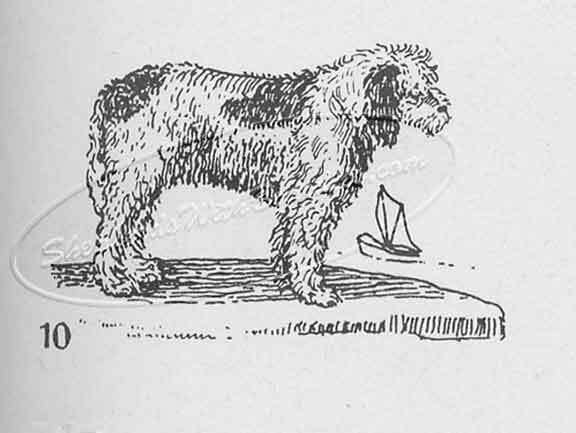 That engraving, shown (in part) below, shows a shaggy and long-coated type of canine similar to some of the early images of the Beardie-like dogs. Notice that the tail has hair hanging in a downward direction, and a beard was presented beneath the chin. To assist the viewer, the other dogs were lightened in the image so that that particular dog would stand out in the foreground. Another engraving had a caption "canis hunde." That image showed a head that could be described as being similar to the shape of some "Beardie-like" dogs from the 20-21st Centuries. What is known about dogs that possessed beards? The famous French naturalist, Georges Buffon (1707-1788) published his Histoire naturelle (shortened title) in 15 Volumes from 1749 through 1767. It was later translated to English in 1781. Buffon concluded that all varieties of domestic species descended from the shepherds' dogs; other authorities rejected that notion. Buffon included an image of Le Grand Barbet in that work. 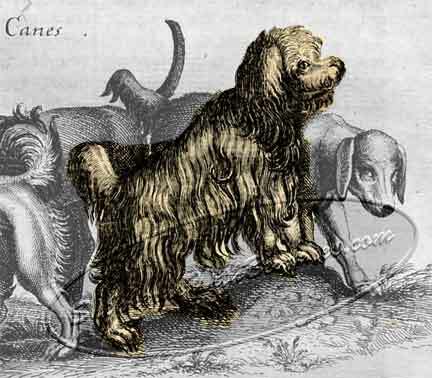 In 1553, Jacques of Fouilloux mentioned the barbet spaniel in his treatise. "Barbet" stemmed from the word "barbe" (French designation for beard). Thomas Bewick (1753-1828), the famous English engraver, included illustrations on what he called "The Shepherd's Dog" and "The Cur Dog" in his History of Quadrupeds published in 1790. The engravings were included in James Watson's book, The Dog, published in 1905-1906. Line drawings of those two engravings appeared in Ash's The Practical Dog Book, page 108. Ash identified "The Shepherd's Dog" by Bewick under the name of "The Collie." 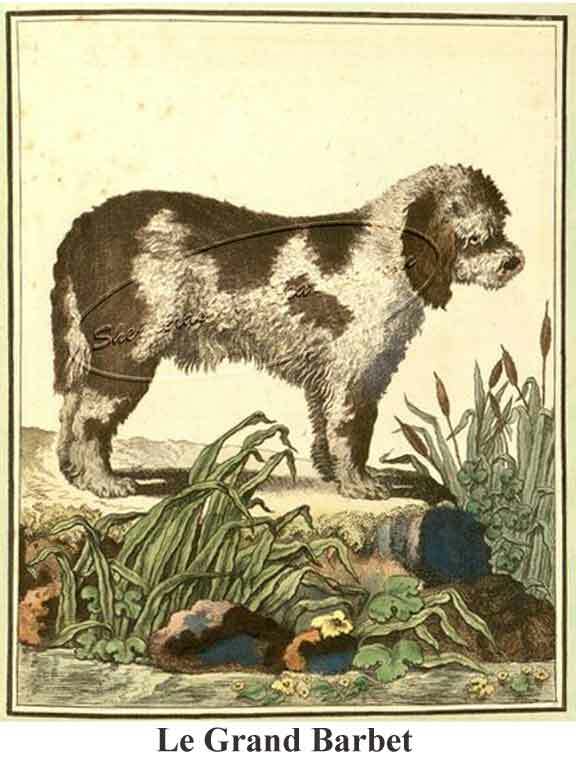 "The Cur Dog" by Bewick was called "The Bob-tailed Dog or Cur Dog" by Ash. Why Ash renamed the Cur Dog as a "Bob-tailed Dog" on page 107 of his book is unknown. Bewick engraved an image referred to as "The Large Rough Water Dog." It is shown below and is remarkably similar to that of Buffon's Le Grand Barbet above. Taplin (c.1750-c.1830), a veterinary surgeon, published his book entitled Sportsman's Cabinet (1803). It was actually published under Taplin's pseudonym of "A Veteran Sportsman." Included in the book was an engraving of a Reinagle painting. That picture has been included in numerous Beardie publications. Whether it was a Beardie-like canine could be debated. In one book, the painting was called "The Shepherd's Dog." In another, it was called "The Sheepdog." In another, it was identified as "Old English Sheep Dog." Click here to continue to History - Part II.